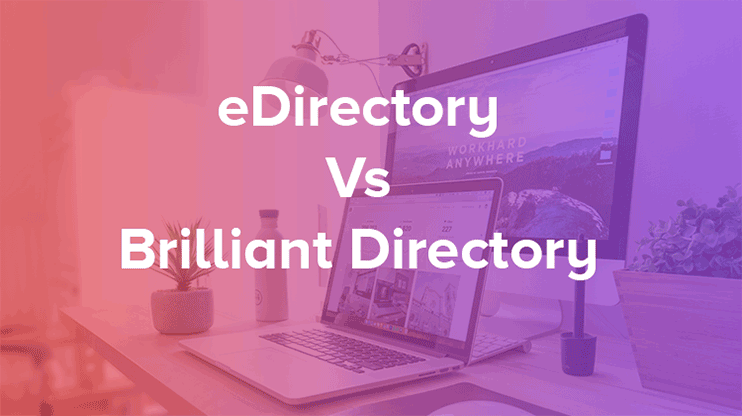 eDirectory vs Brilliant Directory Vs Templatic Directory Software: Which One Is Better? 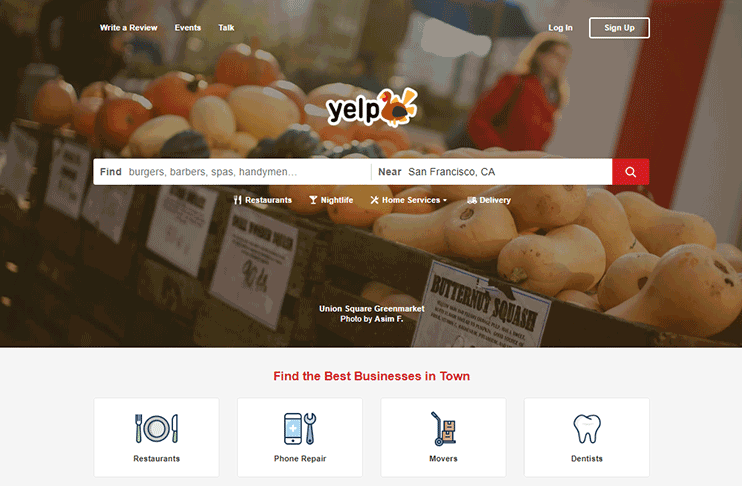 Online Directory websites are becoming one of the most popular forms of online businesses. The prime reason for the popularity of Directory websites is that fact that Online Directories are websites with heavy traffic. As well as that, it comes with multiple forms of direct monetization features. To create such directories you can either lean on independent platforms like WordPress. Or you can go for a Directory website building services competitors like Brilliant Directory and eDirectory. What are these directory building scripts and who should use them? If you are looking for an online business to generate some passive revenue, a directory is one of the best options. Because Directory websites are a website with massive traffic. If you put in some efforts to collect the best listings that can help people, a directory can help you make large profits. Why should you own an online directory? Because it is one of the online business with multiple ways to earn. Online directories are of a great help for people at large. They help them find what they’re looking for easily. So, with little marketing efforts and direct advertising, you can attract good traffic. Paid listing submission feature helps you in two ways. It provides you with valuable data that increases usability as well as helps you earn by allowing businesses to advertise on your portal. Lets you display location-based listings. So you can launch a directory website for your city/town. Directory website contains large amounts of data in form of listings from different users. This effortlessly helps your SEO. Here we have brief eDirectory review compared with the Brilliant Directory review. Both of them are leading directory software that you can use to develop your directory website. How can these tools help your business? 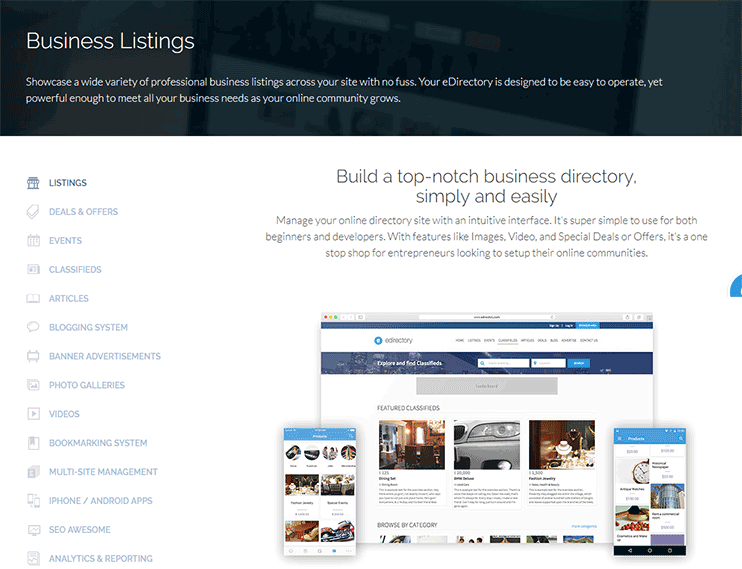 How can the directory building tools help you create an online directory? Creating a Directory website takes in a lot of efforts and hard work. Because a Directory website is unlike ordinary static sites like business websites. Even maintaining a Directory website needs constant efforts. With the themes and website building software available on the internet, creating online directories is easier than ever. However, the important part is maintaining Directory websites. What are the basic things an online directory is supposed to do? Mentioned here are some of the basic features that an online Directory website should provide. Besides them, there can be many advanced features to monetize, to attract more traffic, for lead generation, etc. However, with Directory building software like eDirectory and Brilliant Directory, creating Directory websites is a matter of a few minutes. They provide you the complete infrastructure as well as built-in tools through which you can create your directory websites without touching a line of code. This empowers any person, with little to no technical know-how to create and manage their own online Directory website. Even if you have never created a website before, you can use these online facilities and be an owner of an online Directory business. The next part is – Maintaining Directory websites. The active participation of business and visitors on your Directory website demand constant maintenance and enhancements. You have to keep your online Directory software updated with the latest, correct information. Also, keeping track of the traffic of your Directory website using tools like Google Analytics as well as implementing new promotional techniques to attract more visitors can be considered one of the maintenance routines. The Directory platforms will not only help you create your directory website but also will let you manage it with inbuilt tools and features. They are designed to ease the task of creating and managing online directories. So if you are too worried to start with online directories, be assured the Directory themes, or the online Directory software allows you to do so. Paid listing submission is one of the most important features that lets you monetize with your online Directory. Paid listing submission helps your website in two ways. The submitted listings add to the useful content on your website and therefore improves the overall value and usability of your website. The paid submission listing feature is a way through which the businesses can advertise themselves online. So this feature can help you earn through it. Also, the interested business can choose to be featured on the homepage and the category page. The paid submission listings feature is one of the most important features of an online directory. The listings can be of different types: Classifieds listings, Deals, and offers’ listings, events directory, etc. The Brilliant directory also lets you choose the theme for your online directory from some pre-designed ones. It provides more than 15 directory themes for free. What I found is both these Directory platforms provides you with enough flexibility to create any kind of directory website easily. Even though both these platforms do come with some ready to use setups for certain subjects, you can easily edit them and use their platform for your website. Templatic has been the owner of one of the best WordPress Directory themes since years. This WordPress Directory Theme was developed with non-techies and busy business people in mind. However, even though WordPress is quite easy to learn and deploy, many users look for the platforms that make their work easier. Hence, this directory platform is designed with utmost ease of use in mind. The directory software from Templatic lets you create the online directory websites of your choice in minutes. No struggling with installation and setup. Just log in and start creating your directory website on your own. 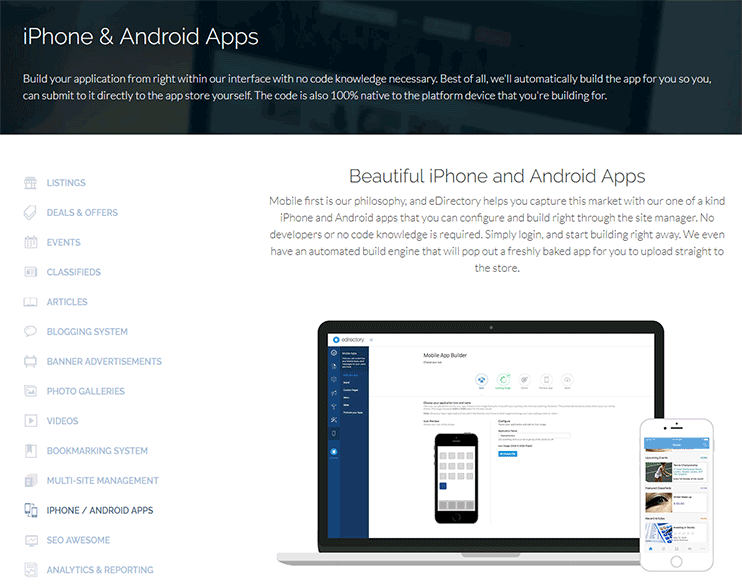 Currently, we have mobile apps for almost everything. For instance – There are fitness apps that act as personal trainers. So, a mobile application for your Directory website is a real enhancement. Apps make accessing your website through phones much easier. Even though the best and most popular web design available nowadays are mostly mobile friendly, creating an app for your site will surely make a difference. With both eDirectory as well as Brilliant Directory you can create an app and provide it for download through the app store or play store. So regular users can just download the application and install it on their device so that they can access it anytime they want. Especially when it’s a directory website. A directory app for the visitors will provide them an enhanced experience and easy to find data. With your App installed on users’ mobile phone, they can get push notification regarding the latest news and listings on your website. Responsiveness of a directory website is an important factor contributing to the user experience. Majority of your website users would like to search your website through their mobile devices. Therefore, the Templatic directory software lets you create beautiful directory websites withat perform great on any device they are viewed on. The viewers can get all the information on their fingertips using your directory website created with the Templatic Directory Software. The navigation works well and so the visitors can find the page of their choice easily even on mobile devices. You’ll need safe and secure payment gateways to facilitate transactions on your website. Both of the eDirectory and brilliant directory platforms comes with some integrated payment gateways. The eDirectory software comes with: PayPal, 2Checkout, Authorize.net, Pagseguro, stripe, WorldPay, iTransact, etc. payment gateways included. While the Brilliant Directory platform comes with: Stripe, Authorize.net, PayPal, eway, BluePay and 2Checkout included. Both of the directory scripts take care that the transactions of their users are safe and don’t save the credit card details. When it comes to payment processing and payment gateway support, the directory software from Templatic with some really nice options. The Templatic directory software also provides utmost flexibility in terms of payment processing. It supports more than 18 payment gateways as well as an offline payment method to accept payments through your online web directory. Directory listings are intended to promote the businesses and generate more leads. Therefore, the online directory script should provide you with the feature to generate more leads. Both the directory building scripts come with ready to use email templates to be sent to the visitors at certain events. These email templates are totally customizable. The inbuilt system of online directories is configured to send emails at various events. Also, Brilliant Directory takes it to another level with the inbuilt email marketing tools, custom email template designs, and scheduled email marketing campaigns. Mobile applications make it easier for your visitors to access your website. It helps you boost the visibility of your website through the app stores. Even the push notification feature of an app helps send an important alert to the visitors right on their mobile device. 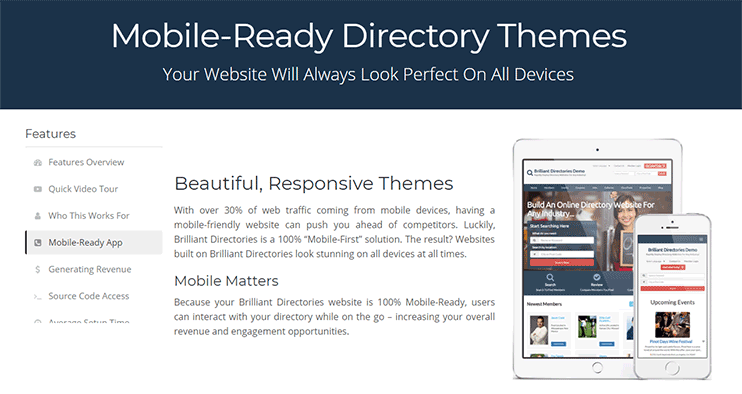 Both competitors Brilliant directory platform, as well as eDirectory, lets you create a mobile application for your website. They enable visitors to easily associate to your website using their facebook or google plus account. They keep your website socially active and connected. While eDirectory provides this feature for free, you’ll have to buy an addon dedicated to this feature when you go to Brilliant Directory. Lead generation is one of the important aspects of Online directories. With the customizable forms in eDirectory, you can easily gather the required information about your prospects. Also, you have the backend feature of tracking the statistics of how your lead generation campaign is performing. On the other hand, Brilliant Directory also takes lead generation seriously. With the available forms, you can start generating leads instantly, and the intuitive management options at the backend let you manage them easily. The Directory Software by Templatic is developed as an online business model. Now for any business, marketing and promotions play an important role. Therefore the Templatic Directory Software comes with enough features to support marketing of your online Directory. 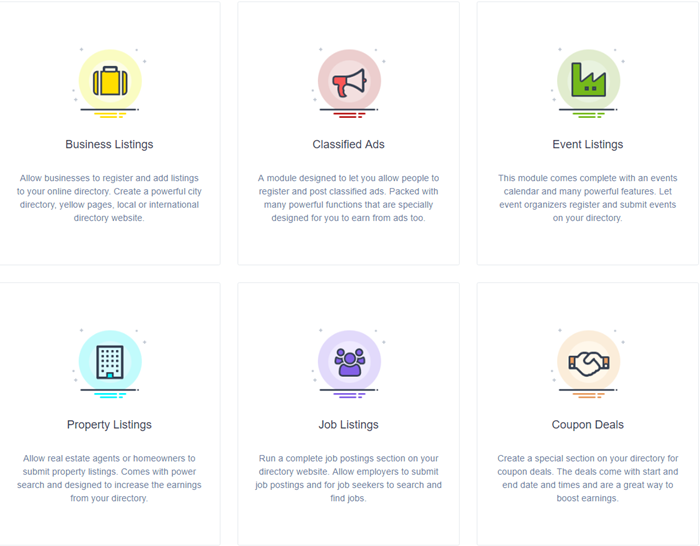 If you are totally into the online directory business and want to manage multiple directories, you’ll probably want a platform that supports multisite. Multisite enables you to control multiple sites through a single dashboard and therefore helps you keep organized. You won’t have to log in and log out multiple times to manage your WordPress websites. Also, you can have a good look at how each of your sites is performing. eDirectory lets you use the multisite feature to manage multiple business websites from one dashboard. Also, you can manage all your customers through a centralized database. You even have the ability to add more sites to your multisite network as your business grows. Brilliant directory too provides this feature. Besides the paid directory listings, advertising banners are the second best and one of the easiest way through which you can earn using a Directory website. The banner advertisements can be static advertisements requested by local companies or targeted advertisements through Google AdSense. eDirectory’s basic plan will not let you monetize your website with advertisement banners. This is quite disappointing. Because for online directories, the ability to monetize through banners is must have. While Brilliant Directory provides this feature as a part of their revenue generation feature and is totally free. As far as revenue generation with your online Directory is concerned, Templatic directory software provides you all the features to earn through it. It contains ad banner spaces to accommodate advertisements into your directory website. You can either go for banner advertisements or rely on advertising services like Google Adsense. 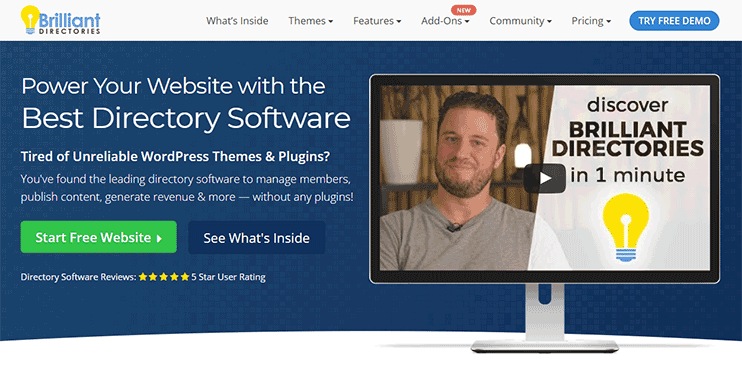 The theme lets you ad monetize your directory website without extra charges. eDirectory lets you control the titles, URL, meta and keywords for your website. Also, it helps you generate an optimized sitemap that you can submit to google. Also, the eDirectory script is coded with the best SEO practices in mind. Therefore, the directory website you create with the eDirectory software is going to be totally SEO friendly. On the other hand, Brilliant Directory is also equally SEO friendly. Customize meta, URL, schema markup etc to optimize your website for search engines. Moreover, you can always manage the content of your website to make it more SEO friendly and useful for the visitors of your website. And the Templatic Directory Software is designed with SEO standards in mind. The code is therefore comes with optimized code to ensure your directory website is easily found in search results. 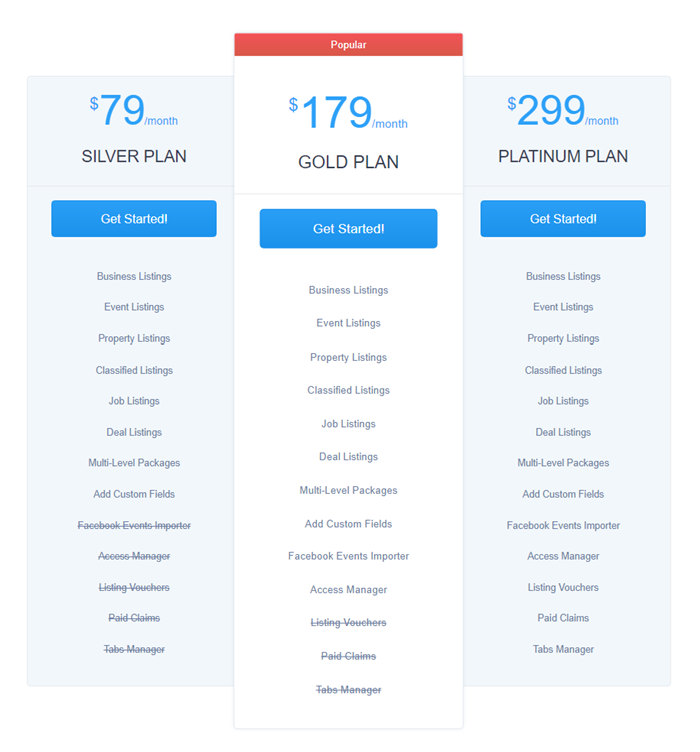 The basic plan for eDirectory starts at $99/month, extending up to $199/mo. eDirectory also provides its yearly subscription at 20% discount on the payable amount. 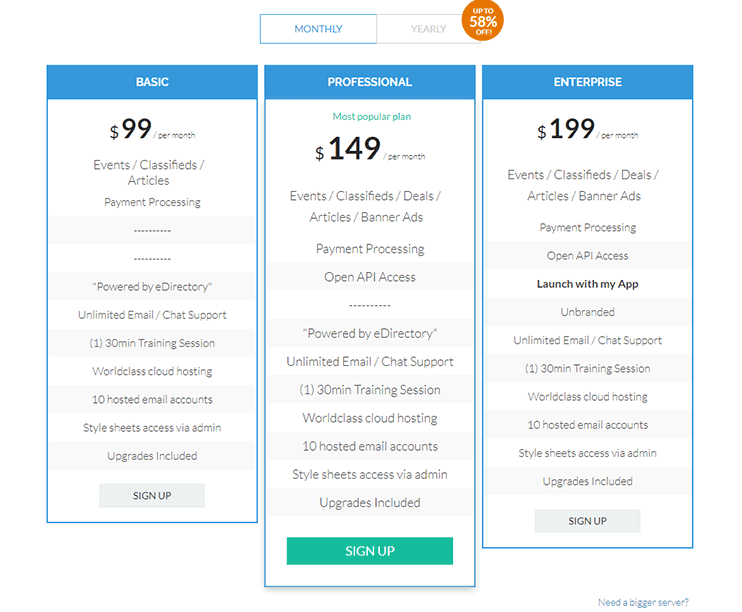 Brilliant Directory, the leading eDirectory alternative, has its pricing plans starting at $95 and extending up to $195. At the same time, the Brilliant directory provides you with an option of one-time payment – at $1450. Here, you won’t have to pay monthly. But of course, for the additional features, you will have to pay on monthly basis. Comparing pricing, Brilliant Directory has much better to offer in terms of per month price as well as the lifetime offer. The Templatic Directory software’s pricing is much more affordable. They let you get started with you basic directory at $80. While there are other options with more features you can choose. Even the basic package supports important post types like job listings, real estate, classifieds listings, etc. With the Templatic Directory Software, there’s no lifetime usage offer yet! Both our Directory building scripts let you integrate additional services in for of add-ons. Both competitors eDirectory and Brilliant directory let you create a directory website that you can expand as much as you want and add more features to enhance the usability of your website. You can let your users as many listings as you want. You can have a look at all the eDirectory add-ons at the eDirectory marketplace. eDirectory lets you expand as and when required. You can choose a package based on your requirements and start your online directory. It’s easy to upgrade to a required package in future. Also, these Directory scripts don’t limit the number of listings you can have on your online Directory website. All the brilliant Directory add-ons can be found at Brilliant Directory’s add-ons library. Brilliant Directory too provides features with their Directory software in form of add-ons. These add-ons can be subscribed on monthly basis. You can subscribe the add-ons you want for the period you want. Visit the Brilliant Directory download addons center to choose your addon services. Both eDirectory, as well as Brilliant Directory, are self-hosted. You won’t have to worry about finding a suitable host and then deciding on a proper hosting package for hosting your Directory website. The pricing of the Directory software is included in the package price. eDirectory provides you an excellent support to set up your Directory website as well as help wherever and whenever need it. The best thing about the eDirectory support is that you get a 30 minutes one to one training session with each of their packages. Besides, the following are the ways through which you can get in touch with the Directory support team at eDirectory. You can use any of the above support mediums while setting up your Directory website with Brilliant Directory. What do we conclude from both the competitors eDirectory and Brilliant Directory review? Both the Brillant and the directory Directory software provide a platform for the non-technical people to create their website. However, they are different platforms and therefore has different features to offer. Also, different directory business definitely has different requirements. You can choose your niche, decide your strategy for monetization. Based on that you can see what directory software has the best to offer for your business specific requirements. To experience how your directory website will appear and function, you should try the directory demo as well as the Brilliant directory demo. That will surely help you decide better. Try eDirectory demo or visit the Brilliant Directory website and click the Try Brilliant Directory demo button. Alternately, you can spend a few minutes and create your own Directory website with the WordPress Directory software which is a Brilliant Directory alternative. Thanks for the useful post. I was wondering which one of the 2 products would be better for me and I think I would go for BD, because of the option for one time payment. Instead of money, focus on what you really need and which one suits your needs the most. There’s also a better alternative https://templatic.com/directory-software/ Take a trial and chose a software that best matches your requirement. eDirectory and Brilliant is bit of on expensive end. I would love to see comparison between templatic vs listingpro.